Flexible Containment Tanks and Bladders | GeoCHEM Inc.
Distribution, Storage and Spill Containment Systems for Fuel and Water. 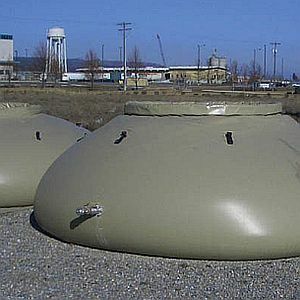 GeoCHEM, Inc. Tanks, Bladders, and Berms can be used individually or collectively as part of an integrated solution. Higher standards and operating procedures result in the industry's highest quality storage and containment products on the market today. We combine lean manufacturing principles with innovative design capabilities to supply the U.S. Military, Government Institutions, and the Private Sector Worldwide. Our flexible containment tanks and bladders are fast and simple to set up and use offering a versatile and reliable solution for containment and protection. We offer a wide variety of standard sizes of liquid containment tanks and pillows as well as customer specified sizes to meet your needs. Our products are environmentally friendly and meet EPA Pesticide Container Regulations set forth in 71 FAR 47330.